Born in Barcelona, Spain on December 5, 1946. Born in Barcelona, Spain on December 5th, 1946. Better known as José Carreras (wikipedia). The youngest of the 3 tenors (the others are Placido Domingo & Luciano Pavarotti). One might argue if Domingo or Pavarotti is the 1rst Tenor, but Carreras is "always" the 3rd Tenor. For me Carreras always was my favorite. Now the older generation is being replaced, so who is the 4th tenor ? The 4th tenor is not really number 4, but the new number 1 tenor (in the world or just in the mind of the tenor lover). For me José Cura is replacing Josep Carreras. Comparison with José Cura. They have both sung Stiffelio, my favorite opera (Verdi: Stiffelio). Almost 20 times have I seen Carreras live from 1990-2005. I have already seen Cura 70 times from 1997-2009. Carreras in mostly concert or recitals. Cura in mostly opera. Operas with Carreras that I have seen live: Herodiade 1995, Samson et Dalila 1996, Sly 1998 and 2000, Fedora 1998. 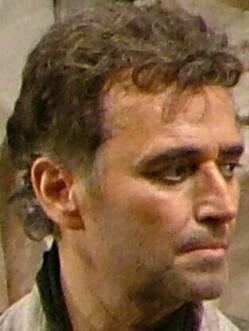 And then I was in Vienna State Opera in 2004, February 27 for the Jose Carreras Gala: Part 1 recital, Part 2 last act of Sly, Part 3 last act of Carmen with Agnes Baltsa as Carmen.